Sand, serves and sunshine made for friendly competition at the 1st Annual Cam's Kids Volleyball Tournament on Saturday, July 16th. 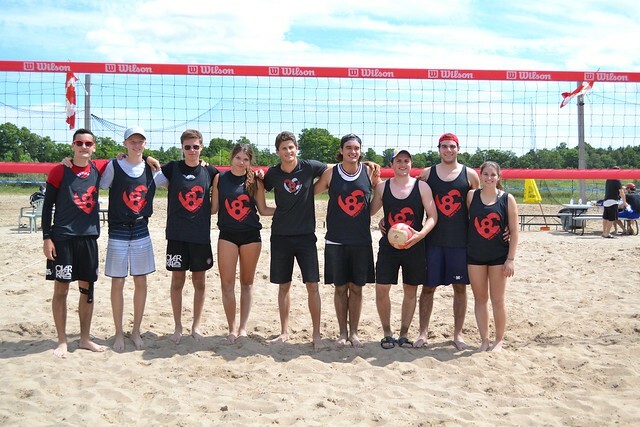 Sand, serves and sunshine made for friendly competition at the 1st Annual Cam's Kids Volleyball Tournament on Saturday, July 16th. Over 70 people came out to Devil's Den Volleyball Centre, including 48 players, 10 ambassadors and many spectators. Each player received a Cam’s Kids T-shirt and a cinch bag for participating. As the sun shone and music played, competitors rallied for a win to move up in the ranks. Teams played for Cam’s Kids tank tops, courtesy of Coho Apparel, as well as a box suite to a Brampton Beast hockey game, donated by the Brampton Beast. This event was led by youth ambassadors Spencer Crowe, Kyle Stinson and Andrew Hicks, with the goal of raising awareness about anxiety amongst youth. The tournament attracted many youth, as well as some adults, making 12 teams in total. Regardless of the competition, everyone had a great time and used the opportunity to have fun and build relationships. The event was generously supported by Uxbridge businesses, including Themed Promotions, OASYS Healthcare, The Meat Merchant, and Peace of Mind Promotions, as well as Coho Apparel. Thank you to everyone who participated in the 1st Annual Cam's Kids Volleyball Tournament, to Devil's Den Volleyball Centre for hosting the event, and to all the amazing volunteers for making it a beautiful day!